Hello all! 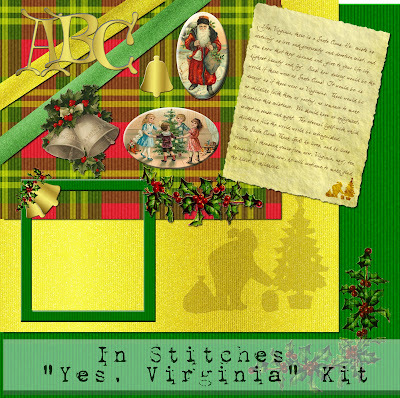 I just couldn't resist making another Christmas kit. I figured most of us won't be digiscrapping our Christmas memories until after the Holiday, so it's still not too late to make another kit. One of my favorite pieces to read during Christmas is "Yes, Virginia, there is a Santa Claus". I decided to create a kit around the letter. 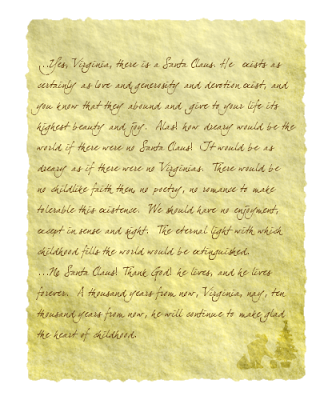 The actual letter is quite lengthy, so I just put in my favorite parts. I've posted a close-up of the letter by itself because the kit preview doesn't do it justice. All the vintage artwork is from Digital Imagery Plus. If you haven't been to this site and you love retro greeting cards and such, you really must visit. Most of the images they give away are not under copyright, so you can use them for all your creative endeavours. I just love it! Today I am giving away the papers for the kit. Just click on the preview to download. Remember to send me links to any of the pages you create with my kits and please, please, please link back to my blog. I'd really appreciate it. Merry Christmas! Thank you so much for this Freebie. I want to let you know that I posted a link to your blog in Creative Busy Hands Digital Freebies Search List, under the C - Kit(s) - Winter Celebrations - Christmas post on Dec. 24, 2008. Thanks again and Happy Holidays.